Support people to plan for their ideal future? Support people to life a life of full citizenship in the community? 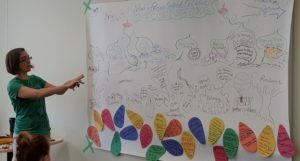 Use graphic facilitation and recording to reach new audiences? These are just some of the topics that Bridges to Belonging can design workshops around. Like all of our Supports and Services, nothing is one-size-fits-all. Have a topic or initiative that you need support with? Contact us and we will start with a conversation to see if it’s a fit!